Serge Ferrari Success Story | Lightweight Manufacturing Inc.
Just steps from the Palmer Museum of Art and adjacent to the Stuckeman Family Building, the new water tower includes a seating and stage area covered by Flexlight™ Xtrem TX30-III membrane from Serge Ferrari. The initial design of the tensile structure was a combined effort between Derek Kalp, PLA, ASLA, and Landscape Architect at the Penn State Physical Plant and students at the Stuckeman School of Architecture and Landscape Architecture, of which Kalp is an alumnus. 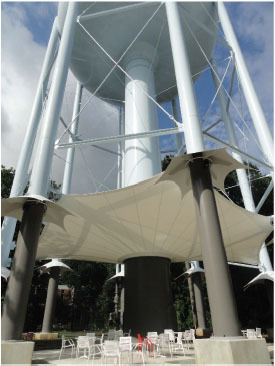 Bethlehem, Pennsylvania-based Signatures Structures hired Lightweight Manufacturing Inc. in Whitehall, Pennsylvania and together they recommended and manufactured the tensile solution for the canopies, while Lightweight Design determined the structural efficiency. Serge Ferrari’s high-performance Flexlight Xtrem TX30-III fabric uses crosslink technology that makes it extremely durable in harsh conditions. 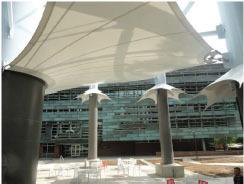 The fabric also offers two times more natural light transmission than standard weldable PVDF membranes as well as twice the heat protection, enhancing the comfort for those utilizing the outdoor performance and relaxation space. Signature Structures served as the overall project manager, involved in every aspect including installation. “Though the project took several years from design to fruition, the design and installation itself were fairly painless for our team as such thorough prep work had been done by all who were involved. The product is easy to install in the field due to its manufacturing process, which captures the stretch and flex up front so it arrives as a near-finished product;’ said John Dufal, President, Signature Structures, LLC. Original article by © Serge Ferrari.